FNL mentors and protégés meet once a week after school for structured, supervised, and very fun activities. Each week matched mentors and protégés spend one-on-one time together building a friendship that crosses age and school boundaries. The FNL Mentoring program is almost entirely youth-led, which means that the students run the show! With the help of a few very cool adults, mentors and protégés make the FNL Mentoring Program happen. What’s great about being an FNL protégé? 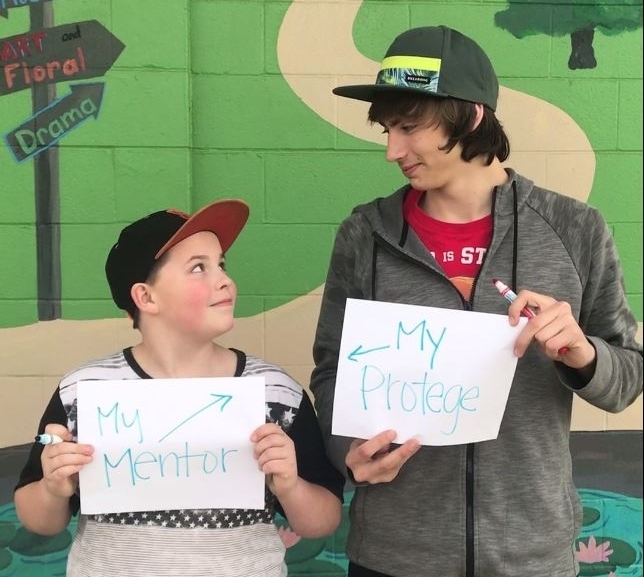 Protégés in the FNL Mentoring Program build a close friendship with an older student who will be there to help them bridge the gap between middle school and high school. Every year protégés participate in an FNL Mentoring Shadow Day in which each protégé gets to spend a full day with their mentor at high school meeting their mentor’s friends, participating in high school classes, and learning what to expect when they themselves become high school students. What’s great about being an FNL mentor? Mentors in the FNL Mentoring Program empower themselves to be active leaders and community resources. They form a close friendship with a middle school student they otherwise would not have the opportunity to know. Mentors participate in programming that is rich in opportunities and is designed to offer young people support to engage in healthy behaviors, achieve in school, and attend higher education or secure a full-time job. How do I participate in FNL Mentoring? Find more information at the CCOE website!